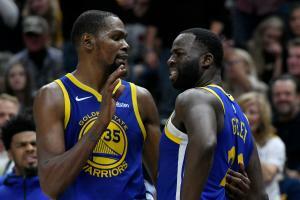 Draymond Green done with title chasing Kevin Durant – KD the same with a discombobulating Golden State? It came from Kevin Durant’s mouth in their game in which the Warriors lost to the Clippers. As Kevin Durant made his way back onto the court following his bench confrontation with Draymond Green during Monday’s Warriors loss to the Clippers, video caught him mouthing something aloud. Depending on your interpretation, it’s either something of major concern to Golden State, or perhaps none at all. Did Green call Durant out? Did Durant call the Warriors best defender and “soul” of the team out? Maybe. One thing is for sure. Durant wants to continue to “have fun” and to prove he is the best player in the world. For him to do that is for him to move his act down the coastal highway from the Bay to Los Angeles next season, join Lebron James and the Los Angeles Lakers, and show the world in a direct comparison on the same team he is the man.